A little more than a year after moving into the White House, Melania Trump remains an intensely private first lady. Unlike other modern presidential spouses, friends say she has insulated herself from the chaos and leaks of the White House by directing the East Wing to operate independently from the West Wing. 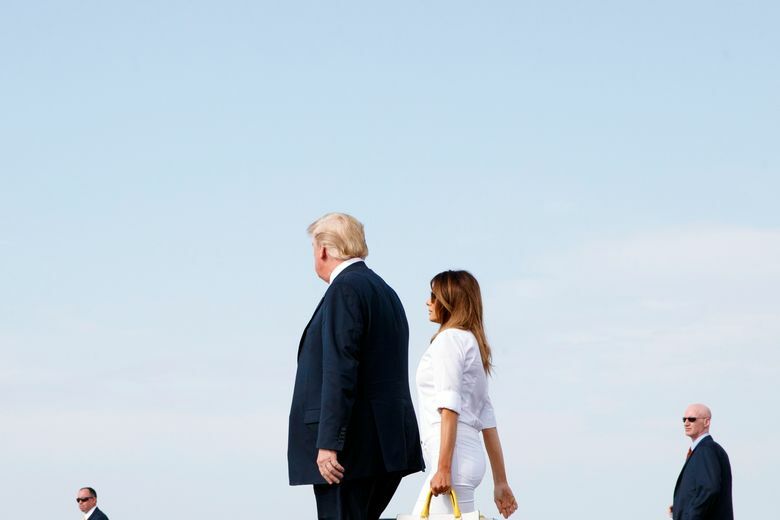 WASHINGTON — Hours after Melania Trump moved into the White House in June of last year, she peered out a window and took in a stunning view of the Washington Monument: “Looking forward to the memories we’ll make in our new home!” the first lady cheerily wrote on Twitter in a snapshot of the tableau. But Trump understood even then that her efforts to forge her own role would be second-guessed and scrutinized at every turn, including by her spouse. Trump, a former fashion model who prefers clean, modern lines, had chosen some furniture for the White House residence in the months before she joined her husband in Washington. Yet in her absence, President Donald Trump — whose tastes veer toward the gilded, triumphal style of Louis XIV — replaced her choices with several pieces he liked better. One of two people familiar with the episode cited it as an example of Trump’s tendency not to relent on even the smallest requests from his wife. A little more than a year later, Melania Trump remains an intensely private first lady still adjusting to the demands of a new life. She has few friends in Washington, keeps a light public schedule and when not watching over her 12-year-old son, Barron, returns home to New York — at least once per month, two people close to her say — for meetings and to visit a small circle of associates, including her sister and her hairstylist. Unlike other modern first ladies who wielded influence behind the scenes, friends say Trump has insulated herself from the chaos and leaks of the White House by directing the East Wing to operate independently from the West Wing. Her staff is small — 10 people, compared with more than 25 who worked for Michelle Obama or Laura Bush — and she has struggled to put substance behind a public service project, which the role of first lady now demands. The nascent progress of Trump’s signature policy effort, a child-focused campaign called “Be Best,” was stymied this month with the departure of her policy director after six months on the job. But Trump remains a Rorschach test for public perceptions of Donald Trump’s White House: People tend to see in her what they already believe about the president. To conservative supporters of the president, she is a quietly loyal helpmate. To his critics, she is an enabler trapped in a gilded cage, occasionally breaking out to express a divergent opinion or make a high-profile gaffe before retreating again into silence. In June, the Slovenian-born Melania Trump, 48, was the only senior administration official to visit multiple detention facilities near the United States’ border with Mexico after thousands of migrant children were separated from their parents as part of the administration’s zero tolerance immigration policies. 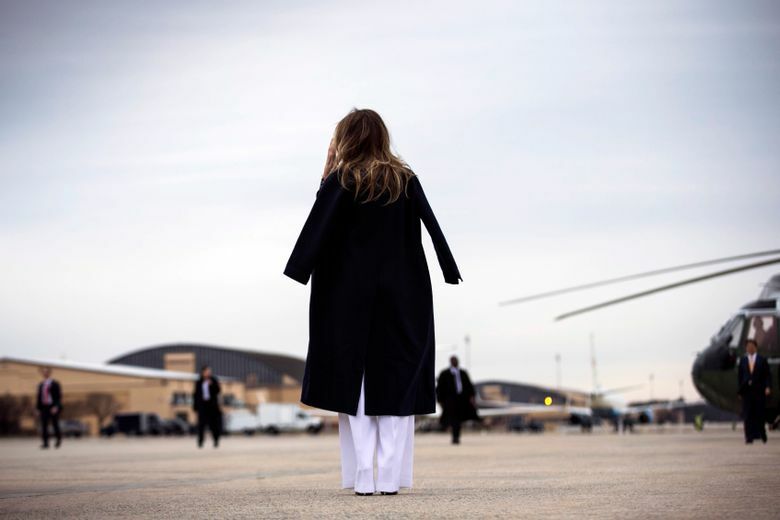 But any good intentions were overshadowed by her decision to wear a jacket emblazoned with the phrase “I REALLY DON’T CARE, DO U?” on an official trip to Texas. It was widely seen as inappropriate, insensitive and unbecoming of her office. Donald Trump seized on the moment to say his wife was addressing the news media, but a person close to Melania Trump said the jacket was actually directed at anyone — both outside and inside the White House — who wanted to criticize her decision to visit the children in light of the administration’s aggressive immigration policies. The East Wing insisted the jacket had no underlying message. In other matters, Trump has made her opinions pronounced. This month her office issued a statement supporting LeBron James’ work with children — hours after the president insulted the athlete’s intellect on Twitter. “It looks like LeBron James is working to do good things on behalf of our next generation, and just as she always has, the first lady encourages everyone to have an open dialogue about issues facing children today,” Grisham said in a statement. 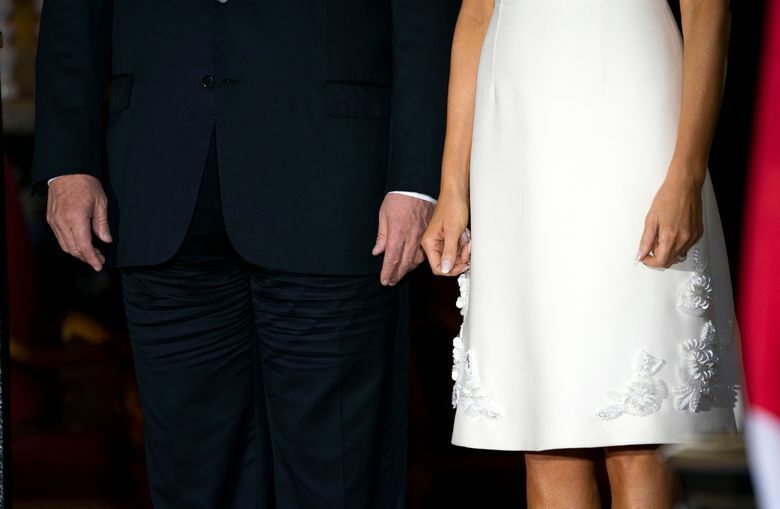 Several friends and aides of the Trumps insist that the dynamic of the first couple’s marriage has not fundamentally changed from their days in Trump Tower. One friend of the Trumps in Palm Beach, Florida, said Melania Trump entered the relationship with Trump with her eyes open, and has weathered 13 years of scandal-plagued marriage and a rocky transition into the White House primarily for the benefit of keeping life stable for their son. She has faced constant questions from critics who want to know why — or how — she can remain with Trump. In January, Melania Trump was said to be infuriated by reports of her husband’s attempt to pay off the pornographic film actress known as Stormy Daniels, with whom he is accused of having an affair shortly after Trump gave birth to their son. The president’s allies say he remains concerned about her reaction whenever headlines about his extramarital behaviors crop up, and he has told friends he feels guilty about the criticism she has faced. In private, a former White House official said, Donald and Melania Trump give the impression that they like one another, but their rapport is not particularly warm. One person who has spent a considerable amount of time around her said Melania Trump was far more relaxed outside the presence of her husband than when he was around. The president does not often accede to anyone’s influence, but those close to the family say Trump is the strongest voice in the president’s life. Several people in the president’s orbit have relied on Trump to try to get back in Donald Trump’s good graces when they have found themselves criticized or on the outs. “He listens to her more intently than anyone and respects her advice and counsel not only because she is his wife, but because her loyalty, grace, trust, elegance under fire, intellect and instincts are time tested and proven,” Thomas J. Barrack Jr., a friend of the president, said in an interview. The sort of Twitter fisticuffs that tend to recharge her husband’s batteries exhaust Trump, who has political views different from her husband’s on some issues, one friend of the family said, and has at times been frustrated by his inability to compromise. But, unlike other people close to the president, she is not afraid to share her unvarnished thoughts with him. “He’s ‘Donald’ to her,” Barrack said. At the White House, Trump tends to stay in the residence, where she has worked with the kitchen staff to arrange more-healthful meals for her husband — though he still prefers two scoops of ice cream for dessert. She does regular Pilates workouts and consults with the White House Historical Association on residence renovations and upkeep. She maintains a separate bedroom from her husband, and when the two travel, they stay in separate hotel suites. Outside of the White House, Trump stays in touch through emoji-laden text messages with friends in New York, including Suzanne Ircha Johnson, whose husband, Woody Johnson, owns the New York Jets; Stephanie Winston Wolkoff, a friend with deep ties to New York’s philanthropic and fashion worlds and briefly an unpaid White House adviser to Melania Trump; Karen LeFrak, the wife of real estate developer Richard LeFrak; and Trump’s older sister, Ines Knauss, who lives a few blocks from Trump Tower. Very few people are privy to the inner details of her life. Her aides regularly deny a widespread belief that Trump lives outside the White House with her parents, near Barron’s school in Maryland. A White House official said her parents, Viktor and Amalija Knavs, split their time among an apartment in Trump Tower, Donald Trump’s Mar-a-Lago club in Florida and the suite in the White House once used by Michelle Obama’s mother. The Knavs recently became U.S. citizens after Melania Trump sponsored them for green cards — the kind of “chain migration” that Donald Trump has repeatedly and publicly denounced. At first, Melania Trump relied on Wolkoff to help her assume her new role. Aside from overseeing inauguration events, Wolkoff assisted the first lady in setting up the East Wing, which included making key hires, writing speeches and developing a child-focused platform with a serious mission. But in February, Wolkoff left the East Wing, along with other unpaid advisers, as a result of an administration-wide security clearance review. While operatives say her departure had to do with reports that her event planning firm received $26 million for work on the inauguration, she has vehemently denied this, and has said that every cent her firm spent on the inauguration was accounted for. In the months that followed, more ambitious ideas were whittled down to “Be Best,” a name the first lady chose, with the broad goals of encouraging good online behavior and exploring solutions to the opioid crisis. At its rollout, the program was greeted with fanfare in the White House. Attendees were given a pamphlet and cookies decorated by White House chefs. The president suggested that Melania Trump choose a different topic to avoid questions about how the wife of a notorious Twitter bully could lead a campaign to spotlight anti-bullying and other child wellness efforts, and he warned her that she was opening herself to such jeers, people familiar with the conversations said. She rejected his advice, and publicly said she was willing to face the criticism. Despite a tightly controlled rollout and assurance from her aides before the event, one White House official said, Melania Trump was still upset by accusations of plagiarism surrounding the launch of the initiative, and was frustrated by the president not backing her up, in public or in private. Shortly after the rollout in May, she was admitted to Walter Reed National Military Medical Center for a five-day hospital stay to treat what her aides called a benign kidney condition. 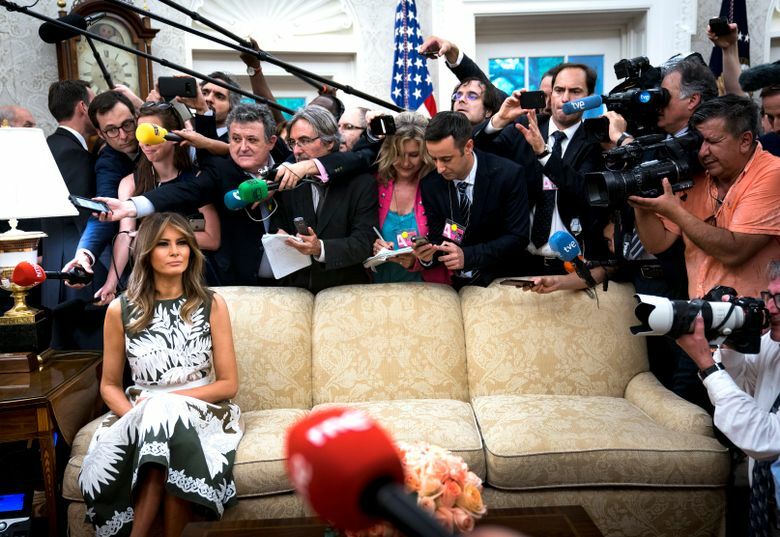 She did not appear in public for nearly a month, and since then has not participated in a dedicated “Be Best” event. Instead, Trump has mentioned her program during five tightly controlled solo appearances since. The East Wing disputed any notion that “Be Best” has not been carried out as the first lady envisioned. The president has offered glowing reviews of his wife’s work as first lady, and brings her up frequently in public and in private. At rallies, Donald Trump has told the crowd that she supports the work he has done as president, and that she is watching from home.